2016 Panini Certified Football: Certifiably Paralleled	Overall rating:	0	out of 5 based on 0	reviews. Well, it’s the end of July, which means that NFL football is almost here. With this in mind we can start seeing more football product coming out for fans to rip into. Wasting no time Panini Certified Football gets right down to business with a minimum of four hits per hobby box. One of these hits is guaranteed to be a rookie patch auto, which in the world of collecting usually means big bucks. Before we tackle the big hits of the product, we should kick things off with the small stuff. 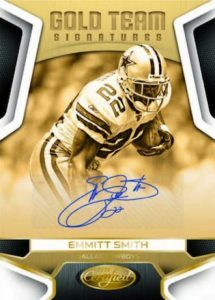 Panini Certified Football has a fairly large base set to work with 100 regular players, 35 immortals, and 65 base rookies. The immortals and rookies are both #/999 in the standard set. In an overwhelming display of shiny cards, Panini has included 8 different parallel sets to accompany the standard base. These are Mirror /499, Mirror Orange /225, Mirror Red /99, Mirror Blue /50, Mirror Gold /25, Mirror Purple /10, Mirror Green /5, and Mirror Black 1/1. Personally I don’t like products that have that many parallels, especially for a base set, but I suppose it will be nice for those who enjoy doing player rainbows. Accompanying the base set to the shiny parallel party are a few different insert sets. 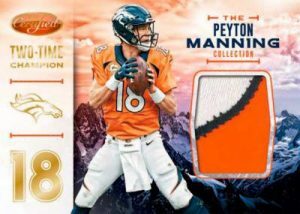 The Certified Champions set has 6 parallels and features names such as Terry Bradshaw and John Elway. Certified Gamers comes with 7 parallels and features the likes of Andy Dalton and Keenan Allen. Panini Certified Football’s Gold Team set tosses Tom Brady and Aaron Rodgers into the mix, among others, and comes in 6 parallels. The Skills set also has 6 parallel versions and highlights names such as Adrian Peterson and Cam Newton. The final regular inserts set, Sunday Certified, also has 6 parallels, and brings many of the same names with it. 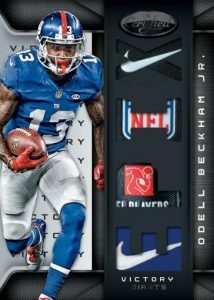 As a fan of a more traditional and conservative type of sports card, I am disappointed in how many different parallels Panini has felt compelled to include in this product. I feel that it waters down the product and takes away from the uniqueness of short printed cards. I am also not a big fan of the fact that these parallels are all if the “Mirror” variety. The shiny foil type cards have become somewhat of a trend in recent years and it is not one that I enjoy. The reflective surface is prone to scratching, and as the card ages the foil shrinks, causing the card to bend, resembling a boomerang. Both of these effects hurt the long term value of the cards and make them close to impossible to have graded successfully. The disappointing nature of the base and insert sets is somewhat mitigated by the fact that that this is a hit heavy product. There is a large variety of autograph sets to choose from, but unfortunately these too have been invited to the shiny parallel party as well. Fortunately Panini has been more cautious in their use of parallels for the bigger hits. Kicking in the shiny door for the autos is the Mirror Signatures set and its various parallels. Here collectors will be excited to see names such as Ben Roethlisberger, Eli Manning, and Jerry Rice. The standard version features a 90 card checklist and offers up varying names as sacrifice to the parallel project. Fortunately the bigger names of this set are super short printed, so even counting the parallels they should still be able to hold a decent resale value. Collectors looking for young players that shine need look no further than the Certified Mirror Signatures set. This 48 card list is jam-packed with young talent. Making use of a basic version (still shiny) that is numbered 99 or less the set introduces names such as Jared Goff, Rashad Higgins, and Darron Lee. For collectors wanting to grab autos of future stars this is a must have set that, once again, shows up at the shiny party with no less than 6 parallels. Not all players are included in every parallel, so at the very least some players will be harder to come by. Finally A Reprieve From the Parallels! Fans of football legends will be happy to know that the Gold Team insert also boasts a select autographed set. Limited to 10 cards each, with only a Mirror Black 1/1 parallel, this 10 card set features some of the all time greats. 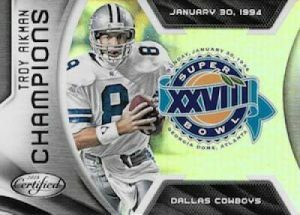 Names such as Joe Montana, Brett Favre, and Dan Marino are sure to drive collectors into a frenzy. This looks to be most sought after set of autographs for the product and will likely have a high resale value. Wrapping up the autograph section we have the Signed and Certified set, and the Gridiron Signatures set, both of whom bring their shiny parallel to the party. Ahh, mem, the true hit/miss of any sports card product. Mem can be worth a fortune for the proper player, or peanuts for an average shmoe. Not wanting to give up the autograph game quite yet, Panini Certified Football provides us with a couple different auto/mem sets to look at. The only thing better than a young stars auto is one with mem! The Freshman Fabric Mirror Signatures set provides just that. 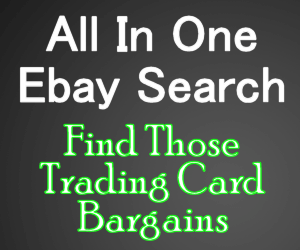 A 40 card set numbered 499 or lower these cards combine the best of both worlds. Fans and collectors can look forward to getting their hands on names like Michael Thomas, Cardale Jones, and Carson Wentz, as well as a whole host of others. Of course, keeping with the products trend, this set is once again packed with parallels. Ranging from Orange /349 all the way down to Black 1/1, these 7 parallels continue the copy/paste ideal that Panini seems to be selling here. The second set of auto relics is the Fabric of the Game Signature set, which boasts names that the casual fan is far more likely to recognize. I mean, who wouldn’t want a Joe Montana or Brett Favre Patch Auto? These guys are the cream of the crop and fans are likely to push and shove to get their hands on them. Even better Panini has gone with a much more tradition set of parallels here, with Prime versions numbered out of 49, 10, and 5. This combination of names and short prints are sure to resell high. For fans that may not have the financial backing to chase autographs, there is always a variety of relic cards to fall back on. As one of Panini’s most popular and long running memorabilia sets, the EPIX cards are always something to look forward to. Eli Manning is once again the big name draw for the set, and is complemented by players such as Amari Cooper and Champ Bailey. With 4 unique parallel sets, Game (/50), Season (/25), Moment (/5 or /3), and Victory Super Prime (1/1), this set breaks away from the overdone Mirror parallels that have been seen throughout the rest of the product. This is always a fun set for fans to collect and the secondary market should be healthy. 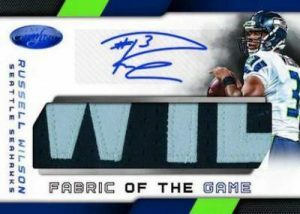 Much like the autographed version, the Fabric of the Game set, offers up an excellent variety of players to chase. Names that jump out at a casual glance include Tim Tebow, Jerry Rice, and Tom Brady. With only one Prime parallel that is numbered to 49 or less these cards are will be a great set for young fans to get into the hobby. The New Generations Jerseys Mirror set is proof that Panini just couldn’t help themselves when it came to making shiny cards. While the basic Mirror isn’t overly obnoxious, they have once again littered the set with coloured parallels which water down and devalue the basic version. Names for this set include Paxton Lynch, Cody Kessler, and Connor Cook. This set may interest younger fans, but serious collectors will likely avoid it. I think that I have made myself fairly clear that I am not a fan of Panini Certified Football. The sets have been polluted with parallels that cheapen the product and remind me of the overproduction problems that have plagued other products. This type of mass producing cheapens the product and results in a cheap feeling card set. Despite the plethora of parallels and shiny garbage the products does hide a few gems. 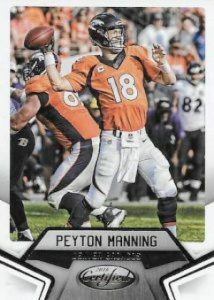 Short printed Prime version relic cards, such as EPIX, and a special series paying tribute to Peyton Manning are sure to draw people in, but it this really enough to compensate for the other sets? At an average price in the $95usd price range hobby boxes seem a little pricey considering the quality of the product. Even with 4 hits per box the product feels disappointing. It could be ok for the occasional box break, but overall I’m not impressed.